Alan Gurr enjoyed a brief racing career at the start of the millennium. He was a noted SuperTourer and then V8 Supercar driver that started racing when he was nine. Gurr showed interest in motor racing very early on. As a four year old he sat glued to the television watching his very first Bathurst 1000. It was only a year later that he discovered go-karts when his dad took him to Oran Park to watch an Australian Touring Car race. In those days go-kart administrators had the entry level racers on display at the circuit trying to appeal to youngsters attending the race meet with their parents. 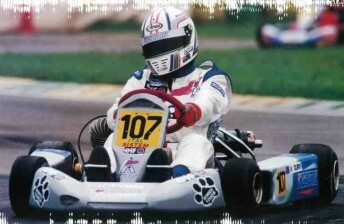 “When I saw the go karts on display at Oran Park I immediately wanted to have a go,” Alan Gurr told Speedcafe.com. “Dad said I was too young, I had to be seven, so as soon as I turned seven I wanted one. Gurr spent several years go-Kart racing against future V8 stars Mark Winterbottom and Michael Caruso. “We all grew up together,” said Gurr. 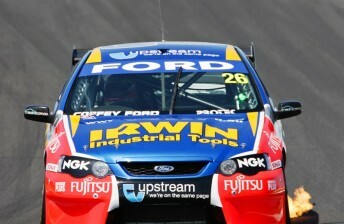 “I was team mates with Mark Winterbottom for a couple of years; I got on well with him. Ryan Briscoe was also there until he decided to go overseas. “Michael Caruso and I had quite a rivalry during our Karting days; we’d often bang and crash into each other in the NSW state titles. “We went from taking each other out and a rivalry of hatred, to a rivalry of respect and we became very good friends. After go-Karting Gurr progressed to Formula Ford. His goal was to move onwards to Formula Holden and focus on an open wheeler career but an opportunity presented to race sedans and his career went in a different direction. 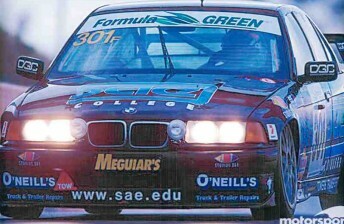 “I was racing Formula Ford when Peter Hill approached me to race the Super Tourers in 2000,” said Gurr. “It was very different to what I was used to. Coming from a go-kart and open wheeler it was different driving a big sedan. It was in his second full year of Super Tourer racing that saw Gurr win the 2002 championship. He enjoyed the series; it taught him a lot about how to set up a car and added to his profile. “It was an enjoyable year, the car was a works BMW and it was one of the more enjoyable sedans that I’ve ever driven,” said Gurr. “It’s hard to say if that series opened any doors for me, but it was good to have my name at the top of the time sheets. It put my name out there I suppose. “Super Tourers were all I was doing at the time, it meant my name kept re-appearing and people took some notice, it certainly didn’t harm me. After winning that championship the world of V8 Supercars beckoned. 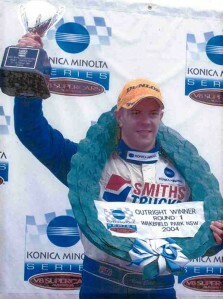 Gurr signed a contract to drive for Paul Morris which saw him competing in the Konica Series (now called the Fujitsu V8 Supercar Series) and the odd main game drive, including selected races in the 2006 championship. “(Paul Morris) is very different, he is one of the more unusual team owners,” said Gurr. “You always knew where you stood with him, whether it be good, bad or indifferent. He was fairly forward in what he taught and how he felt. “There were awkward times and good times but he was the one that was the difference between me not getting a seat and getting one. “If it wasn’t for Paul I don’t know what would have happened because it’s hard to get in to a V8, whether it be the development series or the main game. “There are plenty of people that have the talent that don’t get a drive, he gave me the opportunity and it went from there. 2007 was the watershed year for Gurr. The Queenslander was given the opportunity to be a full-time V8 Supercar driver at Jason Bright’s team – Britek – with Gurr driving the IRWIN Tools backed Falcon. “It was good to have a full-time gig, in your own car with a well credentialed team-mate,” said Gurr. “I learned a lot from Jason, it was exciting, it was the biggest deal of my career to that point. “I think if Jason hadn’t been a part of the team it wouldn’t have been as exciting, but sharing a team and a garage helped me learn more. Despite the buzz in those first few months, the year fell well short of expectation. “It was extremely frustrating,” said Gurr. “We were a bit under-funded and a little behind the eight ball. “If Jason hadn’t been there or I didn’t have data to compare against I probably would have been questioning myself a lot. But every time Jason jumped into my car there wasn’t a lot of difference (in times). At the end of 2007 Gurr’s V8 dream had come to a standstill. 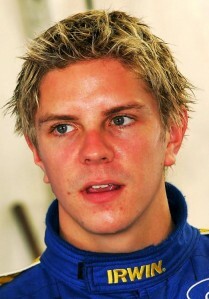 He had been replaced by Marcus Marshall and found himself in the motorsport wilderness. That season, in reality, put a premature end to Gurr’s racing career. “To be honest I didn’t have a lot to do with racing (after 2007),” said Gurr. “There were no real opportunities, except for those wanting me to come along with big budget. I was a bit disheartened. Gurr was so disillusioned with the sport he didn’t even try to find an endurance race drive. “There were opportunities for 2008 and 2009 but at that stage I wasn’t ready to get back in the car, I’d gone stale on the whole thing,” said Gurr. Gurr is now looking to jump back into the cockpit. He’s taking his go-kart for a spin this weekend and is open to opportunities if they present. “If the right opportunity presented itself I would take it,” said Gurr. “I’ve been out of it for a while and I’d need to get a few laps in but you don’t forget how to drive, it’s just like getting back on a bike. “I might have left it too late but I’ll take what I can get. Looking back at his career Gurr enjoyed the opportunity to travel overseas when racing go-karts and treasures the moment where he got to live a childhood dream. “My first Bathurst was special,” said Gurr. “Sure we’d had a mechanical failure, but like many I watched it growing up. As for regrets, Gurr wishes he’d made more of the opportunities and not crashed at the Clipsal 500 in 2004. “I wish I’d made more of the opportunities, I probably took them a bit lightly,” said Gurr. “From a results perspective, after winning the first round in the development series in 2004 I went to Clipsal on a high. “I knew we had a good car, but I had an accident at turn eight, destroying the car and injuring myself. Since 2007 Gurr has fallen back on his skills as a graphic designer. He has been in constant demand since ending his racing career, creating designs for Super Cheap Auto Racing and several car manufacturers (amongst others). He’s also started a business with his partner. “This isn’t overly masculine, but I’ve started up a mobile hair salon business between the Gold Coast and Brisbane,” said Gurr. “My partner is the brains behind it, she’s the hairdresser and I’m the one that does the marketing, artwork creation and flier development. “This is my new interest, it’s very different to what I’ve done in the past but it’s been good, it’s a breath of fresh air. Leaving V8 Supercars doesn’t mean Gurr has no interest in the sport, he still regularly watches events, particularly the big ones. “I don’t base my weekend around it, by I watch or record the events, I really like the major events, like Clipsal, Bathurst and Gold Coast,” said Gurr. “I grew up with many of the guys racing now and have strong friendships with some of them.